MHDC Loans are low-down payment options that offer down-payment assistance grants through the State of Missouri for up to 4.5% of the loan amount, and the rest of the financing coming from a certified lender like USA Mortgage. USA Mortgage was awarded “Lender Of The Year”. The State of Missouri First Place Loan program offers MHDC Loans through a down payment assistance grant. The loans are available through USA Mortgage for properties located anywhere in Missouri. 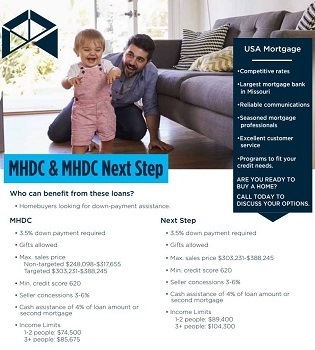 MHDC Home Loans are provided both with Conventional and FHA loans, offering up to 4.5% down-payment assistance, and these loans will leave very little left for the borrowers to bring to the table. MHDC Home Loans Rates are pre-determined by the Missouri Housing Development Commission and available on their website www.mhdc.com on daily basis.website. Clients who want to buy within the city limit and the house won’t qualify for USDA. Clients who wish to use non-owner occupant to help with their debt to income. The MHDC loan is the perfect option for any eligible borrower looking to bring very little money to the table. The down-payment assistance is provided in the form of a five-year 0.00% forgivable grant. If you sell or refinance before the full five years is up a pro-rated portion of the grant may become due. Also Do not need to be first time home buyer for MHDC! Lender of the year in the state of Missouri. Underwriting, processing and funding in the house. Accepts lower credit scores compared to many other lenders. Fast turn times on approval and funding.